HOUSTON–Refracturing wells within even the first few years of production may provide significant economic benefits, especially during periods of downturns in oil and gas prices when drilling budgets are reduced. Horizontal wells drilled in tight oil and shale gas plays are characterized by steep decline curves and generally low overall recovery rates. Given the size of the resource in unconventional formations, and the cost of drilling and completing new wells versus refracturing existing wells, will refrac activity increase with decreased drilling counts in resource plays? Refracturing oil and gas wells is not a new endeavor; refracs were common in the mid- to late-1950s through the 1970s as the “new” technology of fracturing evolved technically into a more highly effective stimulation mechanism for specific formations. The economics of vertical well refracs in conventional formations were often very favorable, with many 60-day payouts. The cost of a refrac in a vertical well is only a fraction of the cost of a new well, but what is the prediction for refracs in horizontal wells completed with multistage hydraulic fracturing? Surprisingly, refracturing horizontal laterals–even multiple refracs of the same wellbore–may make sense when adding reserves by drilling does not. The earliest fracs, with gelled gasoline and oils, gradually gave way to water fracs, and as chemical additives were proven to control problems from scales to clay swelling and proppant types were improved, wells fractured only a few years before benefited from reapplication of advancements in technology. Refracturing of conventional wells slowed noticeably after the 1970s, but as unconventional resources took center stage and developed their specialty fracturing methods, refracs became common again. However, as gas and oil shales slowly moved from being a drilling nuisance to an oil and gas bonanza, operators found that the sharp production decline common in most naturally fractured formations could be reversed, even if only for a short time, by refracturing the same zone. In some shales, refracturing even produced fracture reorientation away from the initial fracture direction. For example, a Mitchell Energy Corp. refrac program in the Barnett Shale in the late 1990s demonstrated enhanced production from vertical Barnett gas wells as a result of refracture reorientation. This advancement of technology is driving the boom in refracturing. The best refrac candidate wells have several common characteristics, including sufficient remaining reserves in the well’s drainage area and large sections of the wellbore that were not accessed initially. The best candidates are in the best rock type, and stress changes can hurt or help production and recovery rates. Good candidates also can be wells in which initial fracture treatments pumped small volumes, low proppant concentrations, or a damaging fluid type. Factors that drive production decline and even low initial production may involve formation structure and the occurrence and extent of natural fractures or large pore groups. For the specific example of naturally fractured shales, accessing the location of the gas and oil shows along the wellbore may be one of the more important parts of candidate selection. Because of shale’s extremely low matrix permeability, the principle flow paths are along the natural fractures. 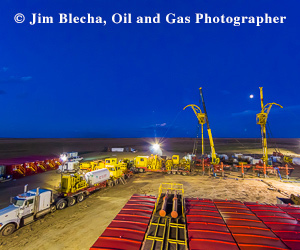 From mud logs and other forms of monitoring gas and oil “shows”, several shales and other tight formations have demonstrated strong flow capacity in some areas along the wellbore, while other areas along the same wellbore may have no significant hydrocarbons at all. Case histories of locating fracture initiation points in the high-quality show areas and avoiding fracturing the areas in the wellbore without oil or gas shows are known, but are not yet common. Other well and formation performance factors such as laminations, faults, areas of high stress, and even frac “hits” (stimulation operations on one well interfering with one or more nearby wells at the same pay zone depth) may be part of the candidate investigation. Successful design and application of refracs depends on finding and refining the refracture treatment. At first, refracs in shales were thought to only be extending the reach of the fracture stimulation through using large volumes of slickwater, replacing the higher-cost foam or gelled fracturing fluids. Slickwater fracturing, a low-viscosity ungelled water fracture fluid that fell out of favor in the 1950s, was primarily fresh- or saltwater with a small amount of friction reducer. What intrigued many operators was that this fluid appeared to be invading and opening the closed natural fracture system, creating complex or network fracturing and gaining at least an order of magnitude more contact area within the reservoir. Production improvements on refractured vertical shale wells were often startling, since the production immediately after the refrac equaled or was even higher than the initial production. However, sharp post-refrac production declines persisted and even a second refrac did not temper the production decline. Obviously, the shale stimulation environment is very different from conventional reservoirs. The answers to the complex behavior are elusive, but have their origin in how fluids actually move in ultralow-permeability reservoirs. Depending on natural fractures as a primary flow path also requires the natural fractures to stay open. This creates the need for a different fracture or refracture design approach. With the acceptance of highly deviated multifractured wells, with roots now more than 40 years old, some in the industry believed that refracturing in shales would lose appeal since the fracturing process for shales had matured and the density of the initial fracture contact was much higher than in vertical wells. What was perhaps not considered originally were the varied reasons for the rapid production declines, and the uncanny resurrection of those same production levels–and declines–following a refrac. Propping narrow natural fractures may also have complications, including proppant embedment in ductile shales, high in situ stresses that prevent the opening of extensive natural fractures, and keeping only limited proppant near the wellbore. The initial microcracks and natural fractures in the more productive shales, although often extensive over large areas, frequently were filled with calcite and were extremely narrow (on the order of 0.002 inches when they were not calcite-filled). During a fracture treatment, permeability in natural fractures may widen and permeability may increase from microdarcy levels to nearly 100 millidarcies. But if the natural fractures are not propped, fracture width will be lost as stimulation and connate fluids are removed, and permeability–as well as the production rate–will decline sharply. The industry has experimented with increasing levels of proppant, mainly 100-mesh sand, and multiple companies are reporting adding 5 million to 7 million pounds of proppant for all refracs in a single well. Early production rates are proving the technology and some flattening of decline curves has been reported. One example is a refrac pilot program implemented by BP America Production Co. in the Woodford Shale (see SPE 168607, presented at the 2014 Society of Petroleum Engineers Hydraulic Fracturing Technology Conference). There are many ways to pump a refrac. A single large refrac with diverting is one of the best methods for cost control and effective treatment. This type of refrac may be a departure from the large initial designs that had 10 to 30 or more stages, and the focus is on reopening and stabilizing initial fracture paths as well as taking advantage of stress realignments provided by production to increase contact areas in the reservoir. Established fractures and new areas are both targets and can be combined in a single refrac, if diverting options are fitted to the design. Adding perforations is a possibility as long as the number of open perforations is low enough to allow fracture extension and new breakdowns. Refracturing specific intervals with a straddle packer on tubing or coiled tubing. The type of refrac depends on well conditions and local economics. The timing of a refrac depends on the condition that created the need for a refrac and whether that condition can be reversed by refracturing. The timing for some conditions may be “never.” Insufficient remaining reserves or geologic factors such as regional fracture systems that allow the first wells in a field to produce from a large area, reducing reserves and pressure across the field, are examples of the “never” classification. Timing may be influenced by completion- or reservoir-dominated problems. Completion-dominated reasons for a refrac include overflushing of proppant away from the wellbore and production of fluids (and proppant) before the fracture closes. Flow capacity in the intersection area of a transverse fracture with the horizontal well is a vulnerable component in producing a multifractured horizontal well. Flow velocity through this highly restricted area may be in excess of 100 feet per second, easily enough to remove untrapped proppant either during the last injection steps or early production flow before fracture closure. In low-permeability formations such as shales, fracture closure may take several days before proppant flowback will no longer be a possibility. Examining declines in gas and oil production is instructive to both demonstrate the importance of natural fractures on liquid flow through the shales and to express the timing of a refrac by showing natural fracture closure. Drawing on Mike Vincent’s extensive refracturing work (see, for example, CSUG/SPE 136757, presented the 2010 Canadian Unconventional Resources & International Petroleum Conference, and SPE 134330, presented at the 2010 Annual Technical Conference & Exhibition), a schematic of gas-to-oil ratio and liquids rate behavior in a Bakken producer was overlaid with very rough trend lines for GOR and oil rates that showed near mirror-image reactions (Figure 1). This reworked figure highlights the obvious closure of the enhanced, but unpropped liquid flow routes in this well’s drainage area. Gas can move more easily through narrower fractures than more viscous liquids. Refracturing opened, but did not stabilize, the drainage paths, as seen by the relatively quick decreasing oil rate and the increasing GOR. Refracturing for naturally fractured formations must focus on creating and stabilizing complex fracture development. Refrac economics depend on well cost versus cost and returns on an effective refrac design. An analysis of 16 refractured Eagle Ford oil wells showed an average EUR increase of 57 percent, with the increase ranging from 10 to 184 percent (see SPE 173340, presented at the 2015 Hydraulic Fracturing Technology Conference). Thirteen of the 16 oil wells had experienced declines of 85 percent or greater before the refrac. The timing of the refracs ranged from nine to 43 months, with a small difference between EUR increases on time-to-refrac groupings of nine to 12 months (50 percent EUR increase), 13 to 23 months (68 percent EUR increase) and over 24 months (49 percent EUR increase). Because of oil and gas price volatility and variances in refrac designs and costs, payouts are not estimated. The evolution of a refrac design into an effective and economical treatment likely will take several jobs to deliver the best results. Incorporating learnings from fracture application and well performance into successive treatments is critical. For this reason, many companies are considering refracturing campaigns rather than one-off refracs. The number of times a well can be refractured is probably a function of the reservoir and the effectiveness of the initial refrac. As fracture designs generate increased contact area and propping effectiveness, the number of refracs possible on older wells (fractured with earlier technologies) may increase, but newer wells with better frac technologies may not be improved significantly. It is definitely a question for the future. George E. King is distinguished engineering adviser at Apache Corporation with more than four decades of industry experience. He began his career with Amoco Production Research. King also served as a petroleum engineering consultant and new technology advocate at BP Amoco, an adjunct professor of petroleum engineering at the University of Tulsa, senior vice president of engineering at Rimrock Energy LLC, and a consultant on completion, stimulation, intervention, shale well fracturing, and workovers. He is a former Society of Petroleum Engineers distinguished lecturer, and has served on numerous SPE committees and workshops. King is a recipient of the Amoco Vice President’s Award for Technology, SPE Production Operations Award, and was SPE’s Houston Region Engineer of the Year in 2012. He holds a B.S. in chemistry from Oklahoma State University, and a B.S. in chemical engineering and an M.S. in petroleum engineering from the University of Tulsa.